Changing behaviors is the only thing that will truly change your life. Remember, changing behaviors is the only thing that will truly change your life. So while those crazy articles promise quick fixes that don’t actually work, we go a different direction. We create alongside our clients, asking them questions about what their normal days look like, how they use their spaces, and what they like and dislike about their current areas. If we help our clients to think creatively and efficiently about their spaces and assist them in creating functional routines around these spaces, behavioral change can happen! But that’s not what those articles will tell you about, because that’s a lot more time and work than they want to promise. Last week we had a lot of fun with our low key, fun guide to decluttering your closet, this week we want to share our favorite pieces to use in that clean, simplified closet. You may have done the work to clear away the pieces that are damaged, stained or unworn, but now you want to know how to functionally use the space. The pieces we recommend here are ones we actually use ourselves. (You can see several of them used in the lead picture on this post.) We install these pieces in our own homes and our clients’ spaces on a regular basis. And remember, these are the items we recommend you buy after you’ve edited and decluttered your closet. This will allow you an accurate picture of just how much stuff you have to organize. Just do it. You hear us talk about this a lot on Instagram. 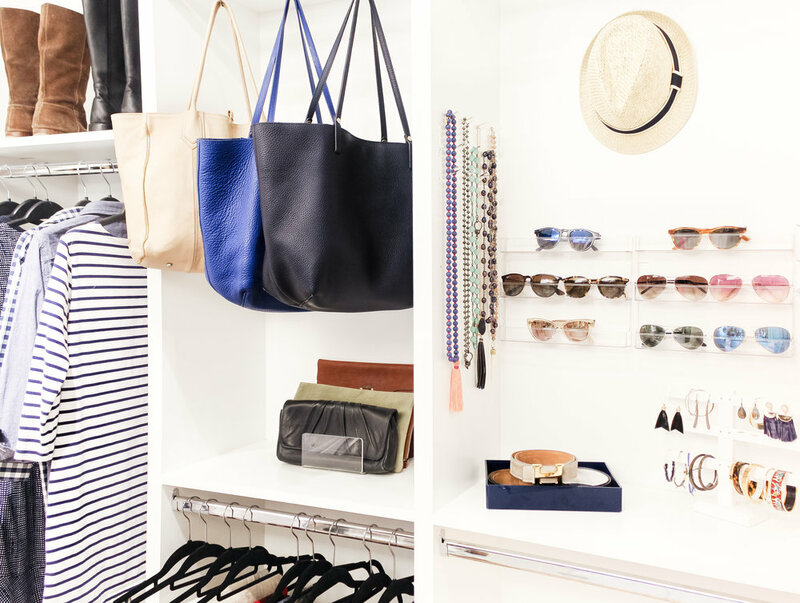 Just this simple step can make your closet look 100 times better. These will give you a smooth shoulder and a uniform look in your closet. They are of nice quality and sturdy. If your closet has heavier items, these would work well for you. I use these racks to hold sunglasses. I find sunglasses are hard to store and this is my solution. You can easily see all of your sunglasses and storing them this way, they don’t get scratched. Clutches can be very difficult to store in a way in which you can see them all at once and that they aren’t pushed together. With this acrylic collator, you can file away (and you know I love to file everything!). Remember from this kitchen feature, filing as much as you can vertically will be a lifesaver! Using this collator keeps your clutches in your line of sight and prevents them from falling over. It’s no secret that I love hooks and use them everywhere possible! I also love that hooks take up very little space but can hold a lot. I use these hooks in my own spaces regularly. I use one by my shower to hang a towel and another in my closet to hang my pajamas and my robe. Make sure, however, that you don’t just use them (overuse them? ha!) and not hang your clothes! Tip: Hooks are great for items you intend to use more than once before washing that don’t necessary need to be put up or away (like pajamas). A lot of our clients (and us!) have problems storing hats. The easiest solution are these hat hooks. They are sturdy enough to hold large sun hats. Also, there are no holes to put in the walls so it is easy to modify your organizational design if you do add or remove hats. I have my hats hanging high on a wall; this way they are out of the way and protected from getting squished or misshapen. Another helpful hook tip: They can also be used to plan outfits when packing. We love all of these items for organizing a closet or around the house. You’ll be astonished what just a few organizing pieces can do for your spaces. Let us know in the comments if you use any of these pieces or if you can see how they might function in your space. Or if you have other organizational pieces that you love, share your suggestions with our readers. P.S. Haven’t started your closet’s spring refresh yet? Take a look at last week’s post—a fun, no pressure way to edit your closet in time for the new season.